If you have an aquarium, besides fish, you can have many other creatures in it. One of the animals that make superb aquarium pets is the aquarium snail. Not only does the snail add a little variety to your aquarium, it will also help to keep your tank clean. There are many species of snails that you can purchase from your local pet store. Some people purchase snails to add some variety to their tanks, while others specifically ask for the snails as they want them as pets. Sometimes, you can also get snails in your aquarium without purchasing one. This happens usually when you buy plants for your aquarium. These snails are already on the plants and when you introduce them into your aquarium. So, they manage to find their way into your tank. However, these snails can be pets. But do not worry as there are many other species of snails that can be kept as pets. 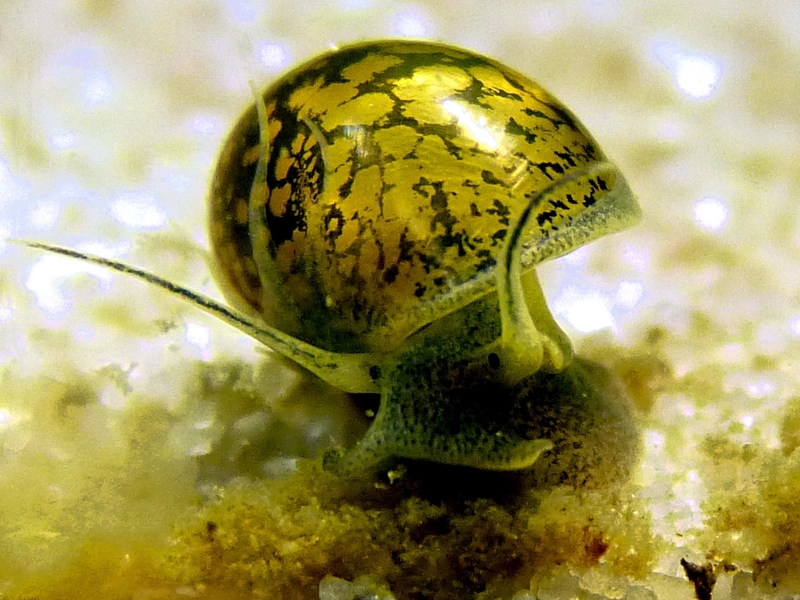 As the name suggests, the Ramshorn snail has a shell shaped like that of a ram's horn. These snails are very interesting to look at. Their shells can be red or black in color. Sometimes, they can also have a checkered pattern on their shell. However, these snails are prolific breeders and can eat plants in no time. So, if you want to keep the plants in the aquarium alive, the Ramshorn snail may not be the ideal aquarium pet for you. The Trumpet snail is perfect for those who want to keep their plants alive. The snail feeds on the debris that is present in the substrate and helps to keep the bottom of the tank clean. However, this snail tends to come out in the night to eat and you will see it hanging on the wall of the aquarium during the day time. Another interesting and popular snail for aquariums is the Apple snail. There are four species of this snail and some of them eat plants, while others are carnivores. One of the species of Apple snail can grow up to six inches. You can get Apple snails in many different colors, like yellow, blue and brown. If you have fish like White Cloud Minnows, Guppies or Neon Tetras, you can easily keep snails in your aquarium without any worries. Not only will you have some unique pets in your fish tank, the snails will also help to keep your tank clean. If the snails are pests that have hitched a ride on your aquarium plants, then you can introduce Clown Loach into your aquarium. This fish will be more than happy to feed on the snails. If you think you only need fishes, plants, and substrates in your freshwater aquarium, you are wrong. There are a lot of people who are not aware that a freshwater snail in an aquarium is a very helpful one. Getting interested? Well, here is why freshwater snails are advantageous. Snails can be used for good and bad purposes, as most forces on this earth are. Commonly, they have gained a reputation as pets for they can destroy plants and do things that will turn your day upside down. They tend to be called as pets for their ability to multiply fast, more so when you put it in a confined area just like a freshwater aquarium. The first question that will probably pop into your mind is " Will they eat all my plants out?". That is possible in reality but with proper management, snails can actually do a lot of good in the maintenance of your aquarium. All you have to do is to introduce factors that can bring balance in their numbers. If successful, you can utilize their use and can even be good pets for you too! There are one major purpose or use of freshwater aquarium snails. You must know that the diet of a snail depends on different materials. However, the majority of them are scavengers that will be fed on plants, especially those that are already decomposing, algae and dead animals. Others will hunt for smaller animals such as gastropods. So, with a freshwater snail, you can have a help in removing dead animals, algae, and decomposing plants from your aquarium. In short, you have a natural way of keeping the water in your tank clean and free from harmful in your aquarium, right? They serve as cleaners which you can depend on highly. But always keep in mind that it needs your cooperation to actually be successful. Otherwise, the snails can deter the balance in your freshwater aquarium. You will not have a hard time keeping the snails away from the fish eggs because the eggs seem to be less delicious for snails. They tend to snob those eggs away, unlike other scavengers that can easily be tempted by the look of the eggs. This makes the freshwater snails a friendly neighbor. One of the ways to control the number of your freshwater fish is to control the food. Make sure that you are feeding your fish in enough amount only. Otherwise, the left over will be devoured by the snails. When this happens, snake blooms occur. Another way to keep their number is to introduce predators. There are species of fishes that can gobble up snails in minutes. If you think their numbers are already conquering your aquarium, then simply place a Pufferfish in the tank and observe how they decrease. Most of all, you can apply the lettuce method. Put the lettuce leaf on the bottom of the tank by tying something heavy to it. After that, you can pick the leaf out of the tank after the snails have attached themselves to it already. Here are the types of snails which you will find very interesting- snails with Cup-shaped shells, Drop-shaped shell, Discoidal shell, Globose shell, Conical shell. There are many different types of aquarium snails many of which can be good to have in your tank. While some people think of snails as pests (and some are), others buy them on purpose to keep in their tanks. Sometimes, when you purchase plants for your aquarium tiny little snails can be hiding in the plants and you may wake up a week or two later and find your tank to be overrun by snails! Usually, however you can buy large snails at your pet store. There are several types of snails you might consider. Each one looks different and has a different demeanor in the tank. The Ramshorn snail is thusly named as it's shape looks like a rams horn. They come in black, red and sometimes checked patterns. This snail will dine on your plants and can reproduce quite quickly. The Trumpet snail is a live bearing snail that eats that food and other stuff that has fallen into the substrate. They rarely eat plants so this is a good one to have if you have a lot of plants in your aquarium. Usually they hide during daylight and come out at night, but you will probably see them hanging out on the glass of your tank just below the water line when you first get up in the morning. The Trumpet snail can help clean the debris on the bottom of your tank. The Pond snail is the one that typically hitches a free ride into your tank on aquarium plants. Shaped like a football, they reproduce quite quickly and have a veracious appetite for your aquarium plants quickly devouring them. 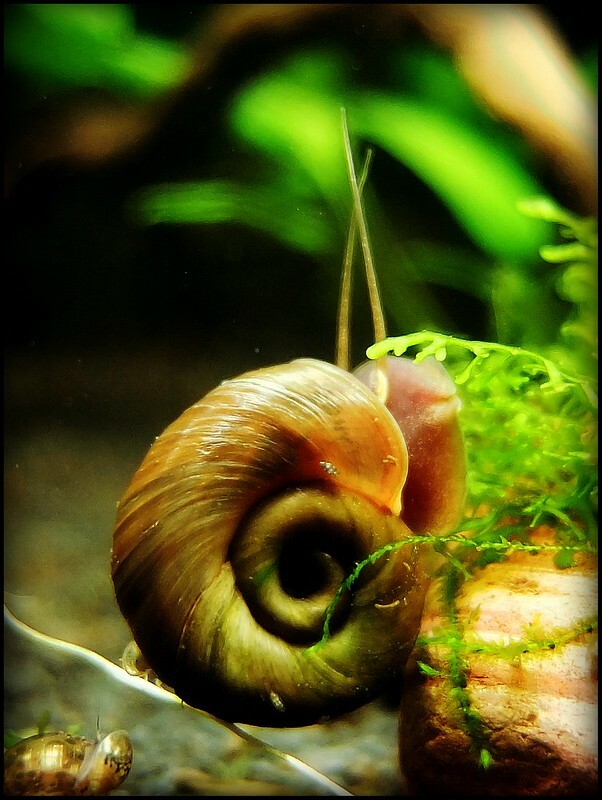 The Apple snail is a popular aquarium inhabitant and comes in 4 different species. These snails can eat aquarium plants so you will have to be careful. This snail can live quite a while and may grow as large as a tennis ball if given great care! Most aquarium snails will do will in a community tank. Some eat algae and some eat the debris on the bottom so these snails can be quite beneficial to the tank. Other species eat aquarium plants, so be sure you know what you are buying if you have plants in the tank. Snails get along good with many types of aquarium fish including Neon Tetras, Guppies, White Cloud Minnows and Danios. However, if you find that some uninvited snails have appeared in your tank, you might try introducing a Skink or Clown Loach into the tank as these guys will happily eat all the snails they can find. Aquarium snails are a great way to add something a bit different into your tank, but you must be sure you get snails that are compatible with your fish. When in doubt just ask the clerk at your fish store and they will be sure to point you in the right direction. Lee Dobbins writes for Fish Tank Guide where you can get more information on setting up and maintaining a fish tank as well as more in depth information on aquarium snails.